Sci-fi civilian vehicles: its like the 1950s, but in spaaace! I rarely see models representing civilian traffic on wargames tables, apart from the occasional display table at Salute or similar. It strikes me as odd that the ruined cityscape environments commonly seen in 40k games dont feature ruined vehicles too. With that in mind when I started stockpiling bits and pieces for my not-so-ruined urban sci-fi terrain project a few years ago, I also kept an eye out for suitable vehicles. Four “Marx Cars of the Future”. The windows in the hardtops are vac-formed pieces provided by the redoubtable Roebeast. 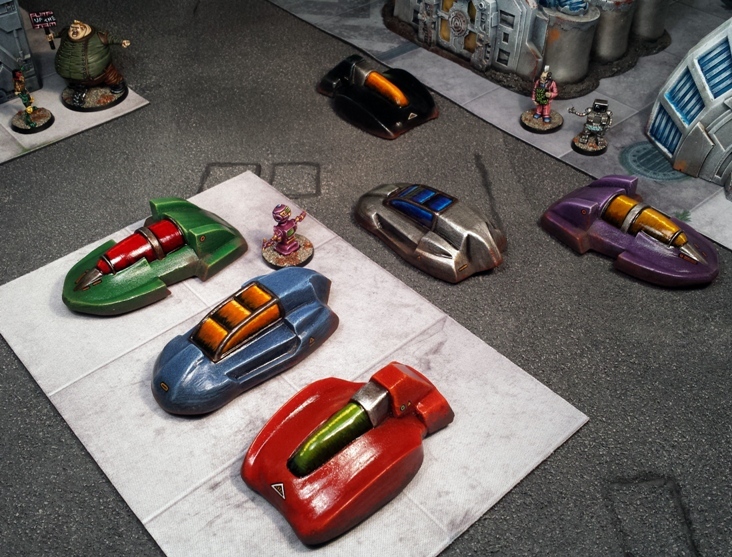 The vehicle models shown here come from several sources. The long, art deco style vehicles shown above are “Marx Cars of the Future”. I picked them up on Ebay back in 2011 or so I think. They are apparently retooled models of kids toys from the 1950s, which explains the really rather lovely retro-futuristic styling. 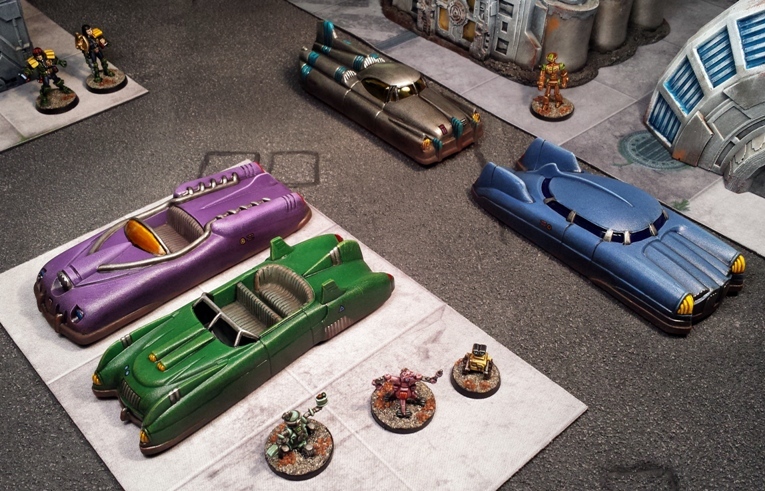 There was a flurry of interest in these cars for use as terrain in Fallout themed tabletop games back when I bought them, but as soon as I saw them I knew that I wanted to have a few representing luxury civilian cars in my sci-fi terrain project. I have also kept a couple back for use as coven limos in a proposed Genestealer cult force in the future: they are pretty perfect for that role too. The four different Marx car designs. Its worth noting that the Marx cars are actually rather crude and simple single piece injection moulded shells. As soon as they are turned upsidedown they really look rather cheap, but a paint job sorted that out. Although not a terribly good film in my opinion, the production design in The Fifth Element was fantastic. The flying car scenes captured a sort of Mega City One environment that hasnt often been seen in cinema. It was an influence on my current terrain project and therefore on these vehicles. As the windows on the rest of my vehicles were painted in bright, comic book colours I decided to tint the windows provided for these Marx cars with Tamiya Clear paints. The most numerous vehicles on my miniature streets are these compact “Rides” from Zombiesmith. Like the cars that at least one of the designs represent, these models come from the budget end of the market, being single piece resin castings of three designs. The manufacturer states “These were designed to be low detail so that they are easy to cast and paint to keep them cheap”. I applaud Zombiesmith for this as it allowed me to bulk out the motor pool terrain with some quickly painted, obviously science fiction designs without having to cannibalise and rework toy cars. As a simple way to get a reasonable number of vehicles on the table pretty fast, they are hard to beat. Three Zombiesmith designs, duplicated here. Real vehicles are covered in little bits of branding and other iconography. I thought that I might be able to dig up some suitable transfer sheets for use as badges etc, but I didnt find what I was looking for, so I hand painted simple shapes onto the various models in this project. They are probably most easily seen on the Zombiesmith Rides. 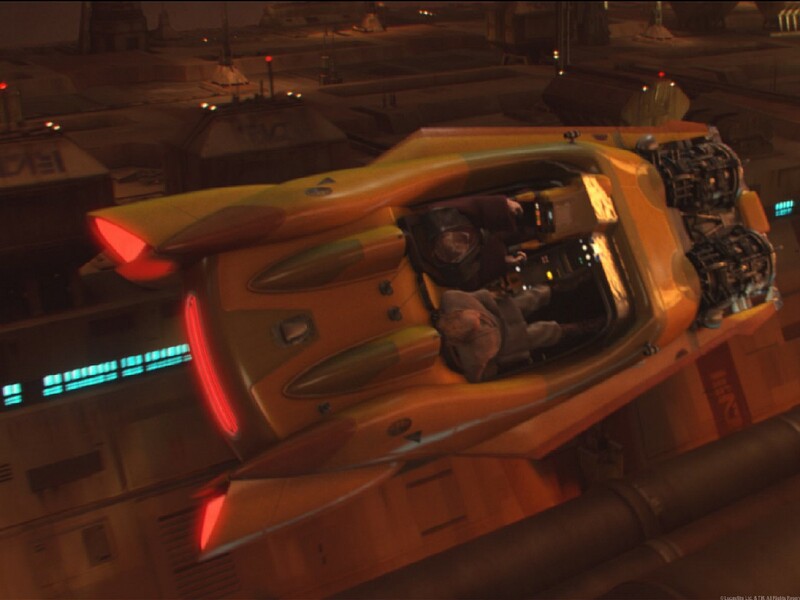 Like the Fifth Element vehicles, the raygun gothic style of the vehicles flying around Coruscant in Star Wars episodes 1-3 also appeal to me. To be honest the handpainted icons are more than a bit slapdash, but as I was only willing to spend a limited amount of time working on civilain vehicles – essentially terrain – they will have to do as is. Thats not a fault of the vehicles models though. I think that the Zombiesmith Rides came out extremely well considering that they cost $5 each. 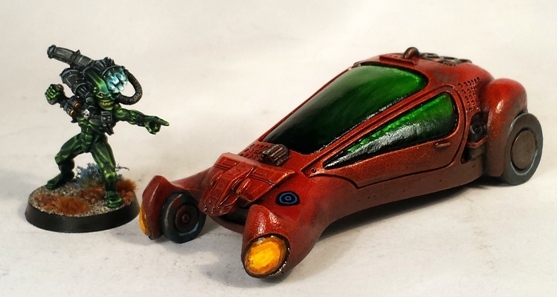 Scotia Grendel “Security Grav Car” and Black Cat Bases “Android Taxi” (OOP). The Scotia Grendel “Security Grav Car” has a fun, eighties futuristic, cyberpunk look, obviously a bit reminiscent of the spinner in Bladerunner. A rather unflattering close up of what I am willing to tolerate as “terrain standard” painting. Lets move quickly along before anyone sees the headlight… too late. The model is cast with a small rotary cannon mounted on the hood. While the thought of keeping that appealed to me, these models were intended to represent regular sci-fi traffic, so I cut the weapon off and covered it with a piece from a toy kit that I bought when hunting for sci-fi kitbash materials in Dublin with theottovonbismark way back in 2000. I have plenty of armed/militarised vehicle models already anyway. 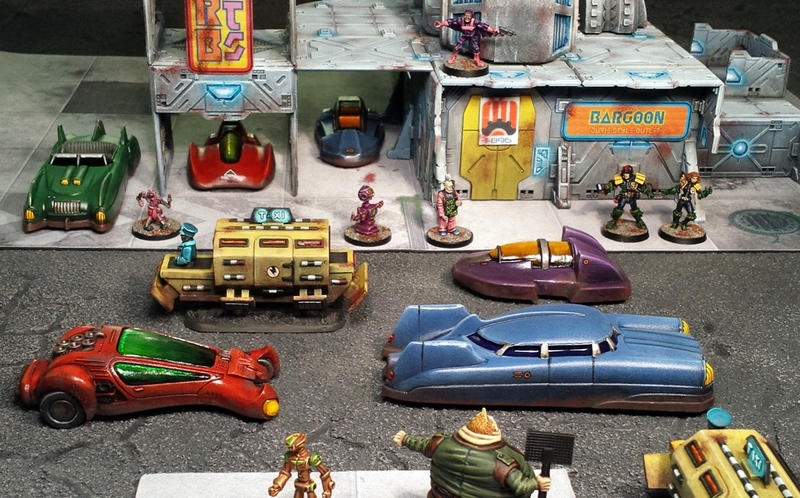 Bladerunner is inevitably a lifelong influence on hobbyists of my vintage. While the “spinner” isnt a civilian vehicle its style is an influence on my vehicles and on many of the 28mm sci-fi vehicle designs out there. Somewhat inexplicably, the Security Grav Car is designed with a recess in which a small jerry can is sculpted on either side of the body. I couldnt work out why a rather slick vehicle like that would have that feature, but rather than stress about it I just played them down when painting them. Lastly up is two of the is the “Android Taxi” from (the now closed for business) Black Cat Bases. Obviously inspired by the “Johnny Cab” from the original Total Recall directed by Paul Verhoeven, I picked up a couple of these models as soon as I saw them (also a number of years ago now, about 2012 at a guess). The models are not a direct copy of the Johnny Cab design and I went for the classic yellow with black checks look commonly associated with taxis when painting it, not a match for the car in the film. I also painted the driver more obviously as a robot. Subtlety in 28mm is not something that I strive for, so it had to be obvious thatit wasnt half a human driving. None of that is going to stop me from saying “Helluva day idnit?” during games that feature the taxis of course. The taxis are quite rough resin bodies with metal add-on elements (the sign, the driver and the anti-grav plates are metal). As I didnt want to spend too much time working on these models, rather than fill the imperfections in the resin parts I decided to paint the cabs to look like they are commonly used and very battered, more like heavily used public transport, like trams. I think that it worked. That said, the bright orange used on the windows made it look a bit more like the interior of the vehicle is ablaze, like its a mobile crematorium, so that didnt really work terribly well. I should really tone it back a bit, but I wont bother: its good enough as is. Two battered hover taxis (OOP, previously from the now out of business Black Cat Bases). Having two of those taxis does allow me to cover a gaming eventuality where a character has to leap into one taxi and cry “Follow that cab!”. Its going to happen: I will make sure of it. 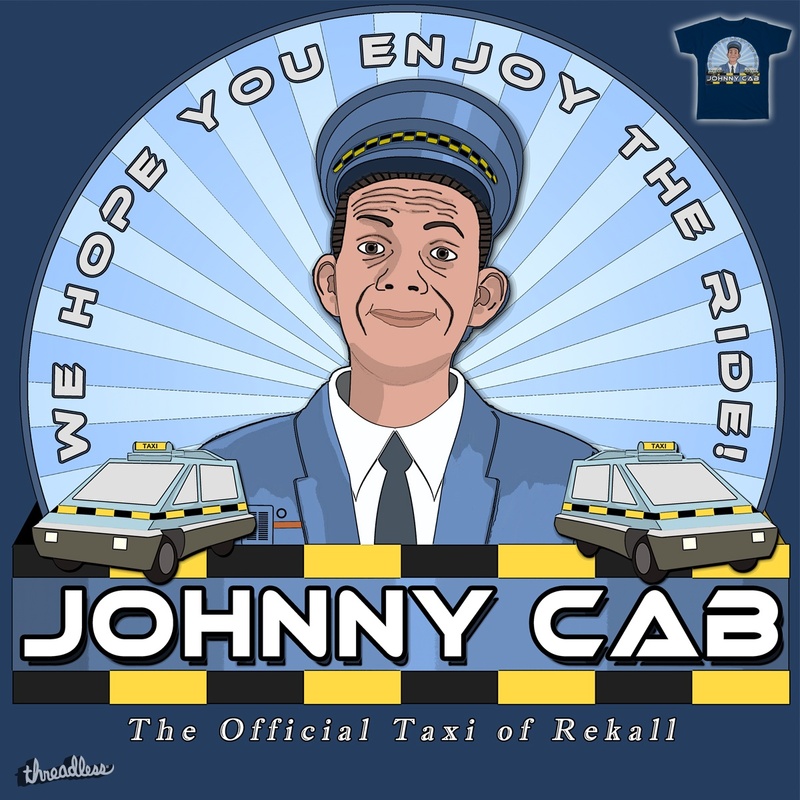 Nice light effect (with missing letters) on the Johnnycab. It’s the little things that bring these pieces alive :). Those Marx cars are wild designs, the people of the 50s obviously thought the aesthetic successor to “fins” was “more fins”. Ha ha! The thing that the fifties “owes” me is dinner in pill form dammit! At this point in my rather mundane existence I think that I would prefer that to a practical jetpack. Thanks for the kind feedback, NSA, Im glad that you like them. Brilliant as always sir. You really made all of those vehicles look superb. Thanks Brian. Your help with the windows of the hardtop Marx cars was hugely valuable. Expect to see some more of your other add-ons here soon. Nice work on these. I just got through Dredd Vol1&2 so I am really digging the MC1 style you have been using lately for buildings, and now these cars. Im very glad to hear that someone who is reading early Dredd stories feels that this terrain is evocative of that setting 🙂 Im not trying to copy specific elements, but generating a general Mega City One vibe is a priority. Im glad that you like the cars, they are a big step in generating that slightly 1950s view of a future city. Thanks for the feedback Lasgunpacker. I have heard that the Marx cars are pricey now. I dont remember how much I paid for them to be honest, but it wasnt as much as I have heard that they sell for now. They are nice though. That flying art deco concept car look really appeals to me and suits the atmosphere that I am trying to generate. Thanks for the feedback Warburton. 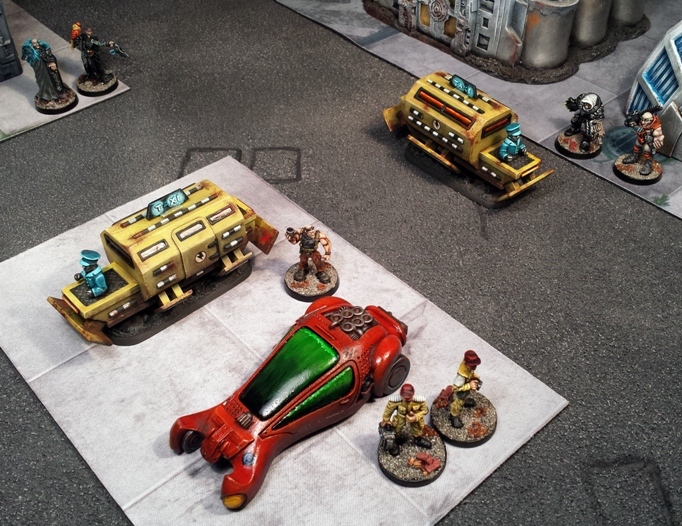 It is interesting to note how very few civilian vehicles have been seen in the 40k setting. Some of the Black Library output features urban settings where civilian traffic is mentioned, but it tends to be vaguely described, such as in the first of the Shira Calpurnia books, Crossfire. The “Inquisitor” rulebook featured a little hobby piece on the creation of a civilian vehicle, a small truck sort of affair, more rural than urban. A big point was made in the description about how the model was one of the few civilian models that had been made in the studio, compared to the hundreds (thousands?) of military vehicles seen. So 40k civilian vehicles are pretty much virgin territory, with the exception of the Genestealer Cult limos. My take on the civilian vehcilces is a little more raygun gothic, a little more like something in the Abnett Inquisitor books (themselves essentially James Bond in space) than most, but I do think that conceptually the vehicles fit in to the notion of an urbanised area of an Imperial planet pretty well. The cars are great. They make a huge difference to the games, both in aesthetics and during the game. It’s easy to place cars about the board in places other terrain would look odd, and roads are no longer killzones, but can be filled with abandoned and parked vehicles. It’s a level of terrain you don’t see very often sadly, but in Sho3boxville, it’s rush hour. You are right about the ubiquity of the cars as terrain pieces. Barricades and dumpsters and cryogenic tanks are nice terrain pieces to have available for scenarios, but they can easily look a bit peculiar, a bit incongruous. As you say, civilian vehicles fit into all sorts of settings easily and convincingly. I have plans to add a few more variations of city traffic to these, but the things that I paint now are gravy: the hard work has been done. Im looking forward to many more Judge Dredd style encounters in an around these cars. A few more civilian vehicles will fit in very nicely with your terrain Suber. Although my terrain is a little weathered, its not quite as scummy and Blanchitsu-y as yours is, so it will be interesting to see how you approach painting some of the same vehicles. Really like them cars! From my short time dabbling in modern/future city terrain for stuff like batman and infinity, I’ve really come to appreciate vehicles in general – they both make the board feel alive while still posing as good sized terrain pieces that you can basically park anywhere. Made me feel like watching bladerunner all over again! You are right, cars are essential to make an urban setting plausible in the least, while also genuinely useful for breaking up fire lanes. It still surprises me that an element as visually essential and mechanically useful is absent from so many tables. Thanks for the feedback Soundwave! I bought them a few years ago Achilles, I picked up three sets of four. I dont think that they were that difficult to get back then. I have used four Marx Cars for this project and I have another three earmarked for a couple of other projects. The remaining five were all traded away over the last couple of months.